Fruit of the Earth Aloe Vera Gel works great for reducing swelling pain, redness and the itchiness sometimes associated with acne. Simply place a generous dab over the breakout and leave it to sink it. Other Aloe Vera based products can also help prevent further breakouts. Get into a routine of using an aloe vera based soap and aloe vera based moisturizer in the morning and evenings to help stop acne in its tracks. Aloe Vera gel also works great on Athlete’s foot because it helps fight the infection, reduce inflammation and soothe any itching and pain affiliated with the condition. Simply rub the gel over the affected area and cover your feet with socks to really get it to sink in and do its job. Fruit of the Earth Aloe Vera is a great treatment for healing blisters because it is an analgesic that helps soothe the burning and pain of blisters. Just rub a little of the aloe vera gel over the blister and leave it to sink in. You can cover it with a band aid if it is located in a sensitive are such as your feet if you want to prevent further irritation. 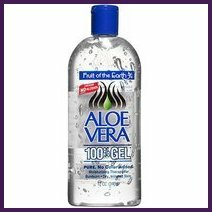 One of the most common and effective uses for Aloe Vera gel is to treat burns. Its analgesic properties help sooth the burning sensation. Simply smooth over burned area and cover with a sterilized gauze pad if necessary. When mixed with water Aloe Vera works well for healing canker sores. Simply mix a teaspoon of aloe vera gel in a glass of water, then rinse and swish the solution in your mouth before spitting it out. The bateria in your mouth will be killed by the aloe which will help disinfect the canker sore. Aloe Vera works wonderfully when it comes to reducing itching, so it is especially effective when used on chicken pox. Simply rub some of the gel on itchy areas for instant relief. It also helps to prevent scarring. Like Canker sores listed above, Fruit of the Earth Aloe Vera gel also works well for relieving pain and burning on cold sores. Simply dab a little of the gel on the cold sore and leave it to sit. Aloe Vera works well to help heal and moisturize dry or windburned skin. Especially effective on hands, simply rub a bit of the gel into the skin to moisturize and soothe. Strangely enough Aloe Vera works well in a pinch as a hair gel. A small dime sized portion will pretty much do it. Fruit of the Earth Aloe Vera Gel also works for helping to heal herpes outbreaks. Apply the gel to the effected area, then cover with a gauze pad to keep it concentrated and working. Because it works so well for providing pain relief and reducing itching, aloe vera is the perfect solution for soothing insect bites. Simply dab a little of the gel on the bite and leave it to do its job. When massaged into painful and sore muscles, aloe vera will help soothe and reduce the achiness and stiffness. Due to its analgesic properties, Fruit of the Earth Aloe Vera Gel works wonderfully in reducing the pain of sunburns. Actually, sunburn treatment is one of aloe vera’s most popular uses and will bring almost instant coolness and pain relief. Aloe Vera gel mixed with water can also help to reduce toothache pain. Mix one teaspoon of the gel in one cup of water and swish it around your mouth before spitting it out. It won’t only help soothe the pain, but helps kill bacteria as well. Aloe Vera Gel is also great for helping to get rid of warts. The most effective way to use this treatment is to soak a cotton ball with the gel and then place it directly over the wart. Cover with a band-aid to keep it in place. Continue to do this at least once a day until the wart disappears.